Most companies have started to allow customers to order products on-line. With e-commerce comes more business but the order profile is different than traditional channels. These are small sized orders across many different customers. Expertise – most 3PL warehouses have in-house experience in picking and processing large volumes of small orders quickly and accurately. Retailers can allow 3PL to service the e-commerce business while they continue to concentrate on traditional distribution channels. 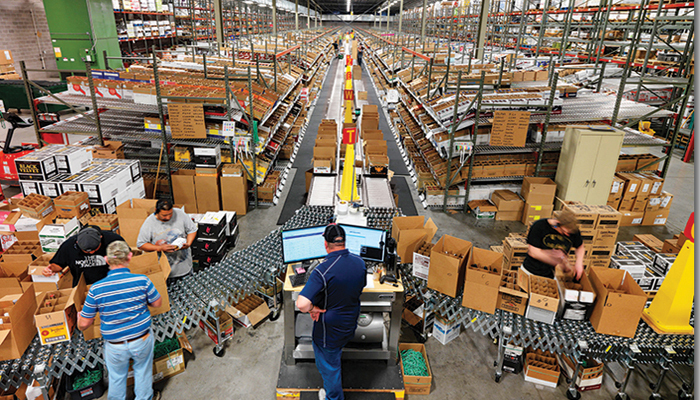 Quicker delivery times – larger 3PL warehouse companies will have multiple warehousing centers across various regions. This will allow them to optimize delivery times to your customers by processing orders from the warehouse ‘closest’ to the customer. Reduced freight costs – because 3PLs service multiple clients from the same facility, they are able to consolidate parcels from individual clients into less than truckload (LTL) or truckload shipments. This will allow them to negotiate better rates and pass those savings back to you the client. Seasonality stress – many businesses experience seasonal fluctuations in e-commerce volumes (e.g. Christmas). 3PL warehouses have flexible labour resources that can be re-allocated to client needs as dictated by seasonal demands. Scale Operations – e-commerce growth is very difficult to forecast. By using a 3PL warehouse, your company will be able to scale their operations up and down as market volumes fluctuate without having to invest in warehouse space. Handle Customer Returns – returns are an issue for everyone, but especially for e-commerce business. 3PL warehouse companies specialize in customer returns. If your company is in the process of introducing e-commerce into the warehouse, feel free to contact JDH Warehousing Systems Ltd. Our consultants will help develop an appropriate e-commerce warehouse solution for you.